"The ornate shiny metal trim on the prow, called the ferro, always has six bars under the curved top piece. These represent the six sestiere, or districts (sixths) of Venice." Sometimes three smaller bars are added, representing the three islands of Murano, Burano and Torcello. Terrific image and a little lesson to boot. Very cool. Ginnie Hart: Thanks, Michael. It was fun to learn about the gondola ferro! Believe me Ginnie, we're not all the same, as these elegant craft appear to be..
Ginnie Hart: Actually, you'd have to see the entire gondola, Chris, to see the differences between them. I do find it intriguing that they all start here, showing their solidarity? This is a fabulous picture and I love that information. I looked up on some information about the 'ferro' I read the other day. This is copied and pasted from WIKI (thank you WIKI) "The ferro is the distinctive metal design at the prow, or front, of the gondola. The ferro has gone through over 1,000 modifications since its creation; the curled design is not only for aesthetic reasons, but also to defend the gondola from possible damage caused by collisions. The ferro was once made from soft iron, but modern ferros are made with duralumin or other alloys - depending on the metal used, the ferro’s weight can vary from 10 to 20 kilograms. The unique shape of the ferro is famous worldwide – popular tradition maintains that the six teeth represent the six districts of Venice; the elegant curve signifies the Doge’s cap, or the Grand Canal. The semi-circular break between the curved top and the six teeth is said to represent the Rialto Bridge. 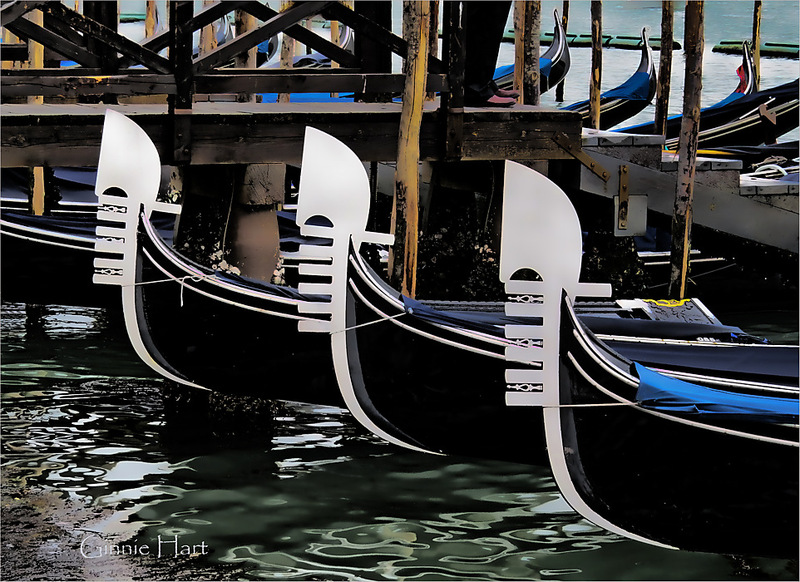 The ferro has become a symbol of the gondola, which is, in turn, a symbol of Venice itself". Ginnie Hart: The added info really explains this all further, Astrid, so thank you for that. It really makes sense to unify all these boats around the same theme of what Venice is all about. Oh, a wondeful image - and happy memories! Ginnie Hart: Yes, indeed, Philine. Oh wonderful! I never knew the significance of the these; I always thought that they were simply decoration.. I expect that this would make a strong image in b&w, too. Ginnie Hart: It's always fun for me to find the significance of such icons, Alan. And speaking of B&W, believe it or not, I used a filter that ferrets out much information to leave only the important bits...not exactly B&W but not totally in color, if that makes sense? Très jolies ces proues de bateaux. Ginnie Hart: Merci, Pascale. It's always good to find out what the icons mean! Ginnie Hart: Neither did I, Bill, did I read about it. Wow I did not realise it was so technical Ginnie. Thanks for the diagram explaining the design. Ginnie Hart: We often get our education when we do the research, Chad, don't we! These boats look nice - can't be the stooges, eh? A sudden thought came to me - I wonder how good they will fare as gondoliers? Ginnie Hart: We won't even try to picture that one, Louis. Ginnie Hart: Gondolas have a special place all their own, Elaine, I'm sure. Now we know, super lined up shot. Ginnie Hart: Now we know, indeed, Martin. What you learn on SC! Who knew? Ginnie Hart: I know, Mary. I know! Excellent symmetry and balance captured in this shot!! Thank you for the background information explaining the six bars on the ferro. Ginnie Hart: Thank you kindly, Steven. It's always good to get educated by what we see! Great picture Ginnie, what was the filter you used? I agree with Mary, I learn something new every day on SC. Ginnie Hart: Thanks, Brian. It's one of the Topaz filters, if that rings a bell? And then I tweak the filter in PS. HA! Graphically powerful image, Ginnie...you do great travel pics. Ginnie Hart: Thank you, Sudipto. They've become synonymous with Venice, haven't they! The good news is they don't have to pay road tax there. I mean river tax. Ginnie Hart: Yes, seriously, LC. They deserve to have no tax ever since they are synonymous with Venice, and is why many tourists come to visit! Without them, what would Venice be, right? Ginnie Hart: It changes so much when you know the history/symbolism behind it, Larry, doesn't it! Nice shot, Ginnie, and interesting info'. superbes mise en valeur de ces belles gondoles!!! What a great capture! Beautifully done. You have such a good eye. I'm inspired. This is beautiful and I like the composition of this photo. So lovely! The composition here is just fabulous. I love the combination of the abstract on the water and the bars! Ginnie Hart: Most kind of you, Robin. Thank you.